PHREEQC contains three surface-complexation models: (1) By default, the generalized two-layer model is used with no explicit calculation of the diffuse-layer composition. (2) Alternatively, an electrostatic double layer model with explicit calculation of the diffuse-layer composition may be used ( -diffuse_layer). (3) Finally, a non-electrostatic model may be selected ( -no_edl). The electrostatic model is the generalized two-layer model described in Dzombak and Morel (1990) with the following modifications: (1) surfaces may have more than two types of binding sites, (2) surface precipitation is not included, and (3) optionally, an alternative formulation for the charge-potential relationship, modified from Borkovec and Westall (1983), that explicitly calculates the composition of the diffuse layer can be employed ( -diffuse_layer). The non-electrostatic model does not consider the effects of the development of surface charge on the formation of surface complexes, with the result that surface complexes are treated mathematically very much like aqueous complexes without activity coefficient terms. The following example of the generalized two-layer model is taken from Dzombak and Morel (1990, chapter 8) with no explicit calculation of the diffuse-layer composition. Zinc sorption on hydrous ferric oxide is simulated assuming two types of sites, weak and strong, are available on the oxide surface. Protons and zinc ions compete for the two types of binding sites, and equilibrium is described by mass-action equations. Activities of the surface species depend on the potential at the surface, which is due to the development of surface charge. The example considers the variation in sorption of zinc on hydrous ferric oxides as a function of pH for low zinc concentration (10 -7 m) and high zinc concentration (10 -4 m) in 0.1 m sodium nitrate electrolyte. Three keyword data blocks are required to define surface-complexation data for a simulation: SURFACE_MASTER_SPECIES, SURFACE_SPECIES, and SURFACE. The SURFACE_MASTER_SPECIES data block in the default database files defines a binding site named "Hfo" (hydrous ferric oxides) with two binding sites. The name of a binding site is composed of a name for the surface, "Hfo", optionally followed by an underscore and a lowercase binding site designation, "Hfo_w" and "Hfo_s" for "weak" and "strong" in the database files. The underscore notation is necessary only if two or more binding sites exist for a single surface. The notation allows a mole-balance equation to be derived for each of the binding sites (Hfo_w and Hfo_s, in this example) and a single charge-potential or charge-balance equation for the surface (Hfo, in this example). Thus, the charge that develops on each binding site will enter into a single charge-potential or charge-balance equation for the surface. Surface-complexation reactions derived from the summary of Dzombak and Morel (1990) are defined by the SURFACE_SPECIES in the default database files for PHREEQC. However, the intrinsic stability constants used in this example of Dzombak and Morel (1990, chapter 8) differ from their summary values, and are therefore specified explicitly with a SURFACE_SPECIES data block in the input file (table 27). The mass-action equations taken from Dzombak and Morel (1990, p. 259) are given in the input data set (table 27). Note the activity coefficient or potential term is not included as part of the mass-action expression; the potential term is added internally by the program. The composition and other characteristics of an assemblage of surfaces is defined with the SURFACE data block. The composition of multiple surfaces, each with multiple binding sites, may be defined within this data block. For each surface, the moles of each type of site, the initial composition of the surface, and the surface area must be defined. The composition of the surfaces will vary with the extent of reactions. The number of binding sites and surface areas, may remain fixed or may vary if the surface is related to the moles of an equilibrium phase or a kinetic reaction. In this example, one surface (Hfo) with two binding sites (Hfo_w and Hfo_s) is defined and the number of binding sites and surface area are fixed. The number of moles of strong binding sites, Hfo_s, is 5x10 -6 sites and the number of moles of weak binding sites, Hfo_w, is 2x10 -4 . Initially, all surface sites are in the uncharged, protonated form. The surface area for the entire surface, Hfo, must be defined with two numbers, the area per mass of surface material (600 m 2 /g, in this example) and the total mass of surface material (0.09 g, in this example). The use of these two numbers to define surface area is traditional, but only the product of these numbers is used in the model to obtain the surface area; the individual numbers are not used separately. Surface area may be entered with the data for any of the binding sites for a surface; in this example, the surface area is entered with Hfo_s. Figure 8. 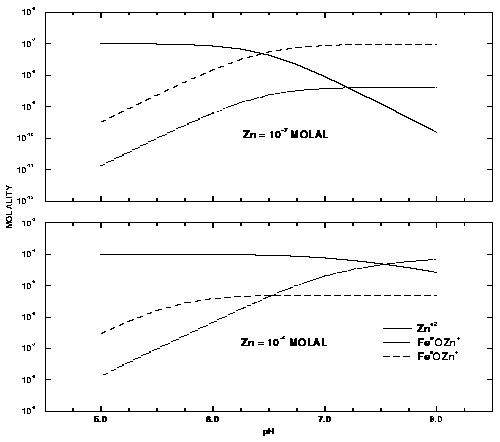 --Distribution of zinc among the aqueous phase and strong and weak surface sites of hydrous iron oxide as a function of pH for total zinc concentrations of 10 -7 and 10 -4 molal. The remaining simulations in the input data set equilibrate the surface assemblage with either solution 1 or solution 2 for pH values that range from 5 to 8. It would be possible to use the REACTION data block to add varying amounts of NaOH to a solution in a single simulation, but the reaction increments would not produce evenly spaced pH values and the size of the reaction increments is not known beforehand. In the example, a different approach is taken that produces evenly spaced pH values with no previous knowledge of the amount of NaOH required, but many simulations are needed to produce all of the desired pH values. Each of the simulations uses the phase "Fix_H+" in an EQUILIBRIUM_PHASES data block with varying saturation indices to adjust pH. The reaction NaOH is added or removed from each solution to produce a specified saturation index which, by the definition of the reaction for "Fix_H+" is numerically equal to the log of the hydrogen activity, or negative pH. Note that, although it is possible to attain the desired pH in all of these simulations, a pH that is sufficiently low will cause the program to fail because a very low pH can not be reached even by removing all of the sodium in solution. The results of the simulation are plotted in figure 8 and are consistent with the results shown in Dzombak and Morel (1990, figure 8.9). Zinc is more strongly sorbed at high pH values than at low pH values. In addition, at low concentrations of zinc, the strong binding sites outcompete the weak binding sites for zinc over the entire pH range, and at high pH most of the zinc resides at the strong binding sites. At larger zinc concentrations, the strong binding sites predominate only at low pH. Because all the strong binding sites become filled at higher pH, most of the zinc resides at the more numerous weak binding sites at high pH and large zinc concentrations.